Finally was able to make an account here so this thread will serve to allow me to cross post from the Wolf3D Haven forum. 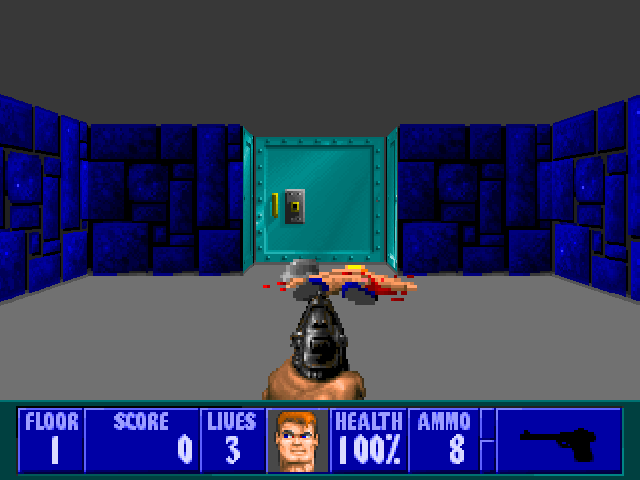 To sum the thread up so far: This is a new Wolf3D/Spear of Destiny source port based off of Wolf4SDL and ZDoom. It will support many of the same (or similar) features that ZDoom has. Most importantly this means mods can be created entirely through scripts allowing them to work on any platform that ECWolf does. 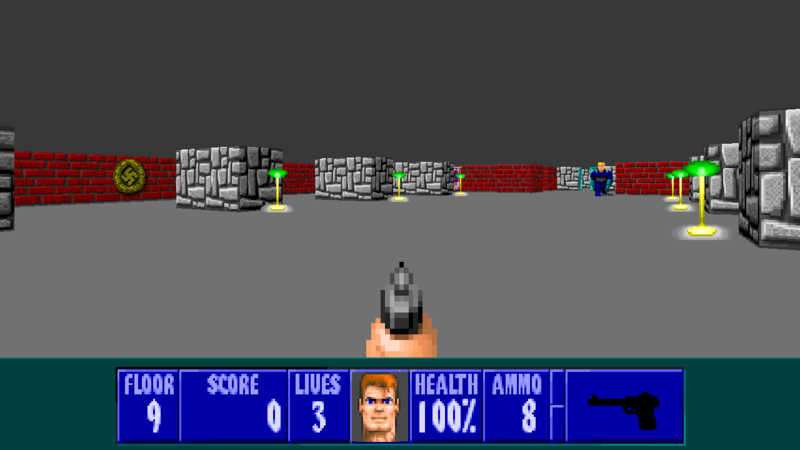 In addition it will support multiple games with a single binary in much the same way ZDoom does. Currently I'm working on implementing a text based map format co-designed by Adam Biser. A release is still a fair ways away since I still have many big features to implement (namely the DECORATE code). Sounds like a cool idea man, so it is like ZDoom, except for Wolfenstien 3D? I have very Big ideas For a Future Mod of Mind. I can't wait to see this in Action. Yes. I'm not using the decorate parser from ZDoom itself, but it should be syntactically similar. There are two main differences, namely tics can be in half units (in order to account for Wolf's 70hz instead of 35hz) and two functions can be applied to a frame (with the 2nd function being executed every tic). Otherwise it uses all the same concepts, so custom monsters, decorations, weapons, keys, etc will all be possible. The palette and colormap code. 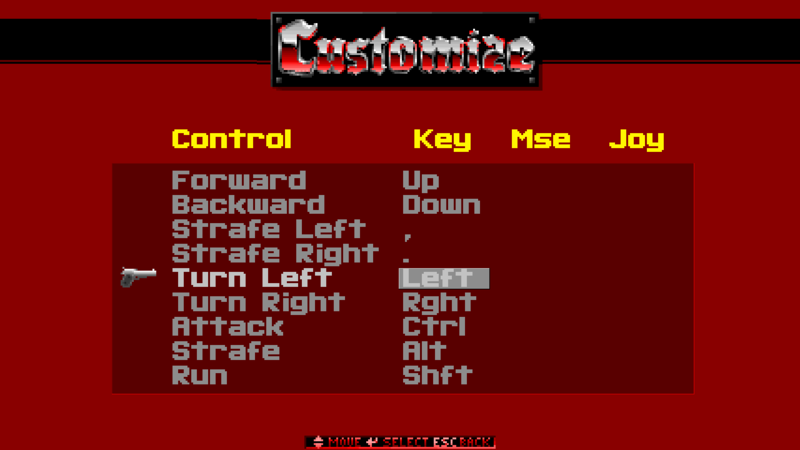 In addition LANGUAGE (I'm considering swapping this out for ZDoom's though) and of course DECORATE are supported although their implementation is my own so some minor differences may apply. In the future I plan on adding support for MAPINFO (although the properties will be different) and pulling in ZDoom's font code. In addition the text based map format is basically based off the UDMF standard, and once I get ACC++ working I plan on rolling out an ACS VM for ECWolf. The DECORATE parser is basically done and I've now moved on to actually implementing the various properties, flags, and functions. Custom monsters are possible now and in fact most of A_WolfAttack is supported (no bullet puffs yet). Working on the Inventory system now which once finished should make ECWolf playable again. Hopefully I should be able to get a public build by the end of the year. I agree with Richter wholeheartedly. This sounds amazing - Zdoom Decorate I always thought was pretty great. I've had a version of my constantly in development-hell project Super Blitzkrieg in Zdoom for a couple of years now; the amount you can do with it in such a short space of time is really liberating for me. Seeing something similar in Wolfenstein would be awesome. If I'm able to complete ACC++ I will be trying to implement a VM for it in ECWolf. I think I might make Operation Feuersturm with ECwolf sometime in the future. Just thought I'd stop by to say things are moving along again! Can't say for sure if I'll make my deadline of "playable by the end of this year," but I'm certainly trying. What we have here is sprites taken from Doom with no modifications other than they were converted to PNG. Of course the wolf sprites are normally loaded as is by default. So what we get from this is high resolution weapon sprites are supported and properly aspect corrected too. However, I must note that I'm now drawing player sprites almost identically to how ZDoom draws them. This means that while we get all the benefits of non uniform sized images, high resolution, widescreen, and what not, the stock sprites aren't drawn exactly like they are in vanilla due to precision issues. I don't think anyone will notice unless they do a side by side comparison as you lose about 1 pixel from the bottom of the weapon when viewed with the normal vanilla screen size. Other than that, the new weapon code is coming along fairly smoothly. I just pulled the weapon slot code from ZDoom so ECWolf now has 10 weapon slots and it allows multiple weapons to be assigned to a single slot like Doom. And of course all this can be done by the mod author without touching the executable. Oh yeah did I mention that Doom style weapon raising/lowering is supported out of the box already as well? Movebob shouldn't be too hard to add, but it's not a priority at this time. Of course, but it will be some time before I get to the point where I can implement it. It probably will only work well on LAN since I don't think I'll ever have the time to write a proper net code. That said someone did offer to write it for me once, so we'll see. I'm taking steps to ensure that adding multiplayer won't be as difficult (that is getting the score and what not through players). Of course, but it will be some time before I get to the point where I can implement it. Well....you use simular code to zDoom? Skulltag is based on zDoom code as well...and has very advanced multiplayer. That said someone did offer to write it for me once, so we'll see. While I pull a large amount of code from ZDoom, most of the stuff I use directly are just resource loading or container classes. All the actor handling and stuff I have to rewrite due to engine and gameplay differences (although I do try to use a similar API). Besides the fact that Skulltag's net code is completely inseparable, the net code from ZDoom or Skulltag won't just drop into ECWolf. While all of that should be possible eventually, it probably won't be in the first release since the goal is to just have SoD and Wolf3D running on the same exe. 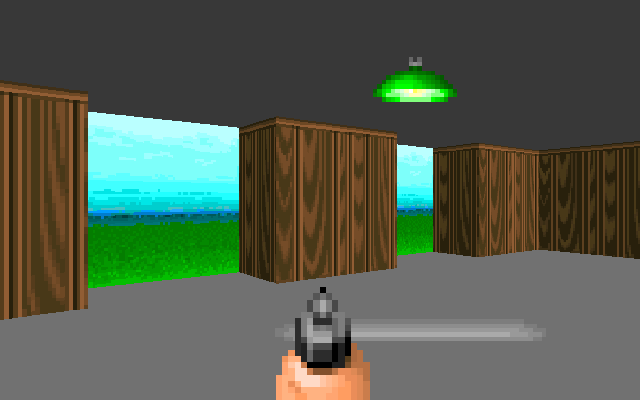 Once that's done I can look to emulating ZDoom action functions and what not. Fix the transfer of inventory between levels. Finish some key elements of SNDINFO, namely random sounds. Make secrets tally work again. Merge Spear of Destiny code. Compile on Windows and Mac OS X.
I keep following this project with interest. Take your Time....I'm REALLY looking forward to this! So today I stumbled across the Hitler fireball glitch. You know, where T_Projectile was accidentally used as an action function instead of a thinker function. Anyhow, the question is how should ECWolf handle this? My initial reaction was to set the fireballs to the slow speed (1.5 in decorate) since I assume this is what most people will remember, however given that it's technically supposed to be 9 I'm considering fixing the problem (probably would be better for game play any ways). ECWolf will obviously not change the speed of the fireballs by the frame rate since that would lead to many problems down the road (especially with multiplayer). I'm all in favor of just fixing it. It's a pretty small element anyway, and honestly I wouldn't be surprised if it was some sort of [Censored] up on id's part. Depending on how strongly you want to preserve the original behavior, I reckon you could add a compatibility option to either make the projectiles move slow like before or even just make a separate movement routine that can be called. Don't know how feasible the latter is without junking up the code too much, though. Seems like a lot of work for a relatively minor element anyhow. I actually decided to go ahead and fix it. In terms of compatibility I think I have one advantage here that, unlike ZDoom, I don't really have to concern myself too much with vanilla mods. Besides those mods would have the speed changing behavior themselves any ways. So I guess I should mention that the latest hiatus is because of my classes being a bit time consuming and Doomseeker has needed my immediate attention recently as well. IIRC I have some unfinished work on my tablet that I'm hopefully able to recover (I tried to install Android on it as a demonstration and that may have had some complications, I think I just need to reinstall the boot loader though). And I finally finished and committed that. So quick update so you guys don't think I'm dead. Finals are next week and then development should resume shortly after that (if I don't decide to do more work while waiting around all day during finals week). This actually sounds really cool! Check and fix aspect ratio correction on signon, intermission, high scores, and end screens. (Not really that hard to do, but some of the old code is a mess.) Mostly done, the only thing I can think of off hand is that the cheat code messages aren't corrected. Reimplement remaining action functions. (This includes custom projectiles and some actor specific stuff.) Only one left is T_BJJump, but also the deathcam needs to be reimplemented. In other words the game works fine as long as you don't mind not being able to finish the last level. Probably need to get a MAPINFO equivalent done. (I could hack it together to work fine without this, but I think it would be more impressive to release with it.) Done more or less, but still changing things as I go. Mostly just SOD support here. One thing to note is I've finally settled on using the Activision release of Wolf3D as the only supported version (mostly because this is what people will get when they purchase the game from Steam). The "Read This" has been restored however so this shouldn't be a big deal since I'll have the patching utility for those who have older versions. Earliest estimate I have is end of this month, but much more likely I should have something by end of June. Once that list is done I'll be sending binary to a few people I know in order to get a tech demo prepared (as well as fix the most obvious bugs). Obviously if any of you are running Linux you can go ahead and mess with it now.